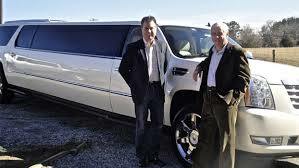 The operator of Tryon Wine Tours is Limo-Zen, a luxury transport service serving the Carolina Upstate. Limo-Zen, owned by partners Ken Feagin and Alan Taylor, launched its service in 2014 to serve the local communities, regional airports, and the Tryon International Equestrian Center. The company specializes in providing professional, private transportation for special occasions, sporting events, wine tours, weddings and inclement weather services, as well as offering area residents and visitors a chance for a night on the town with safety and as an alternative to designating a driver from your group. Limo-Zen serves airports from Atlanta, to Charlotte, as well as Spartanburg, S.C. (GSP), Asheville, N.C. (AVL) and private airports in the foothills. Limo-Zen is a member of the National Limousine Association.